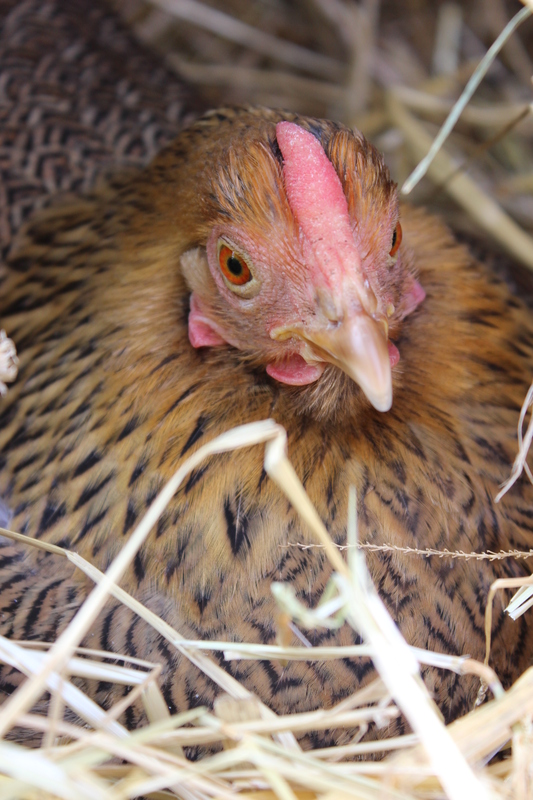 Two of our hens are currently broody and sitting on fertile (we hope) eggs. They are due to hatch on Saturday or Sunday, so we are waiting on tender hooks for the sound of cheeping! We have hatched chicks twice before, with differing degrees of luck, so we will see how it goes this year. We brought 12 French Wheaten Maran eggs from our local farmers market. One of the eggs was rejected by the hens, one broken and one was unfortunately cracked by another inquisitive hen. So we are down to 9 eggs, 6 in one nest and 3 in the other. Our grandmother bantam Ethel is sitting one the 3, she is so tiny that she could not manage any more! Peach, a partridge Wyandotte, pictured above is responsible for the other 6. Both girls are sitting well and seem to be taking their jobs very seriously. I shall keep you posted on progress over the weekend! This entry was posted in Uncategorized and tagged chickens, Permaculture, Permaculture Diploma, spring by emilycrofton. Bookmark the permalink. Looking forward to hearing how it goes 🙂 Am hoping to one day do this myself (well, not personally, I’d let my chickens do the job!). Definitely keen to breed chickens. I have just checked them and can hear cheeping from inside the eggs! Its so amazing, I think we will have chicks tomorrow.